The Chinese new year is coming on January 26. 2009 is the year of the ox. Each year belongs to a different animal of the Chinese zodiac. These are rat, ox, tiger, rabbit, dragon, snake, horse, ram, monkey, rooster, dog, and pig. People born in each of these years have certain personality traits. But diid you know that the Chinese are considering adding more animals to their zodiac? Apparently 12 is not enough to describe all the varieties of people there are in the modern world. The woodpecker is one animal under consideration. The following passage describes the characteristics of people born under the sign of the woodpecker. Those born in the year of the woodpecker are diligent, hardworking, and persevering. They will knock their heads against a problem for a long time, sometimes even knocking themselves unconscious before they can solve it. Woodpeckers are attractive and flashy; they like to dress up. They are garrulous and canâ€™t refrain from chattering during moments that call for silence, reflection, or sympathy: for instance, in church, at a funeral, or after someone has fallen off a bicycle. Woodpeckers are fond of dancing and shopping, and they will often dance while shopping if they hear music in a store. However, they are prone to sudden fits of grumpiness, and have been known to sulk behind trees and bushes, or at the edges of ponds. You are right. The above paragraph was nonsense. Made up. Invented. Balrderdash. Lies. The Chinese, as far as I know, are NOT going to add new animals to their astrological calendar. But that doesnâ€™t mean that you and your students canâ€™t. So hereâ€™s your activity. Give your students the above text. Or play them the audio below, and use it as a model for writing. In pairs or small groups, they should write their own text. It should be about a NEW zodiac animalâ€”crocodile, cockroach, owl, javelina, clownfish–and how people born in this year reflect traits of that animal. (Use your imagination though–no need to be too serious). Afterward, why not create wall calendar with your student’s new zodiac? Go to www.etseverywhere.com for some young learner activities about the Chinese New Year. Click on “holidays” or “new” under the Categories menu. 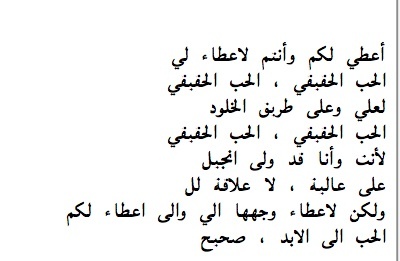 Here is a chant created by five teachers from Aqaba, Jordan, during a training session on November 12, 2008. Have your students chant along with it. In this issue you have a new poem, with audio, about a monster called Paul.Â Also you’ll find some activities from past ETs in Russia issues included below. hideous olâ€™ brute he can be? So Paul the Monster crashed a party. It wasnâ€™t easy to get in. so there was no one to threaten. He wasnâ€™t much a monster at all. Students, in pairs or groups, can finish the sentences below.Â There’s really no wrong answer. Use your imagination.Â (No need to explain the rules of gerunds and infinitives-if such rules exist, they probably won’t help students learn.Â Instead, this activity gives them lots of practice and exposure to certain verbs that take gerunds, and certain verbs that take infinitives.Â In fact, you don’t have to mention gerunds and infinitives at all). Compare the sentences when finished. Maybe award prizes to the most creative or funniest. Ghosts enjoy… walking through the halls at night. Ghosts know how to… eat pizza in the dark. Ghosts avoid… listening to Brittany Spears. Whatâ€™s a C test? Well, starting from the second line of this poem, the second half of each word is missing. See if you can supply the correct letters to finish the words. and h_ _ rear s_ fat a_ _ her ey_ _ like chlo_ _ _ _. 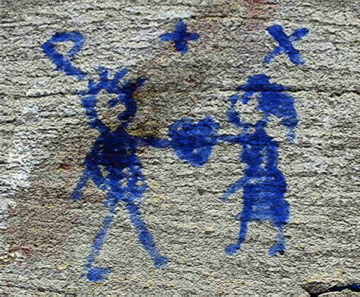 You c_ _ run fr_ _ her, b_ _ sheâ€™ll alw_ _ _ catch y_ _. But _ know _ beaut_ _ _ _ witch t_ _.
with redd _ _ _ hair a_ _ eyes o _ moonlight bl _ _. If y_ _ are sa _ she h_ _ a spe _ _ for y_ _. On h_ _ broom n_ other wit_ _ can mat_ _ her. You ru _ after he_, but yo_ wonâ€™t cat_ _ her. and her rear so fat and her eyes like chorline. You can run from her, but sheâ€™ll always catch you. with reddish hair and eyes of moonlight blue. If you are sad she has a spell for you. On her broom no other witch can match her. You run after her, but you wonâ€™t catch her. 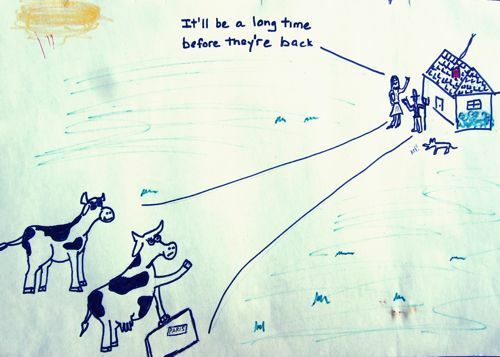 Copyright 2008 Kevin McCaughey & I.M. Poosheesty. In a C-test, half of every second word is missing. An apostrophe counts as a letter. In the four riddles below, students will figure out the missing letters and complete the words. Then, in groups, they can try to guess the answers to the riddles. (The answers are at the bottom of the page). You write these on the board before the students even arrive. That way, students are thinking English language before the class even starts. are already filling the gaps and solving the riddles as class begins. 1. Can yo__ find th_ words fo_ three consec___ days with___ using Mon___, Tuesday, Wedn___, Thursday, Fri___, Saturday, o__ Sunday? 2. This thi__ has fi__ fingers, b__ it isn__ alive. Wh__ is i__? 3. What i__ white whi__ it’s dir__ and bla__ when it__ clean? 4. This belo__ to y__. Other peo__ use i__ very oft__ when th__ are wi__ you, bu__ you don__. What i__ it? I found this grocery shop in Mountain View, California, and outside was a banner reading â€œRussian Products.â€ So I went in and bought some of that kasha that comes in packages. 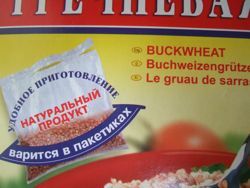 This kasha (buckwheat) was made for export, so there were English instructions how to cook it. These instructions made me laugh until a tear fell out of my eye and landed on my elbow. 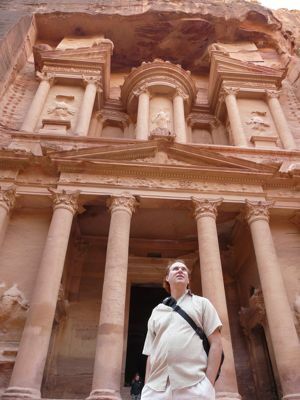 It’s really a mish-mash of a translation–thus, kasha malasha. Here’s the task (which will of course only work for Russian-speaking students of English). 1) Give a pair of students or a small group the English text. Their job is to translate it into Russian. 2) When they have done so, show them the original Russian text (see below). Discuss any surprises. 3) Now that they have both versions, ask them to re-write the English translation, making it accurate and comprehensible. To place a bag in a plenty of the boiling added some salt water. 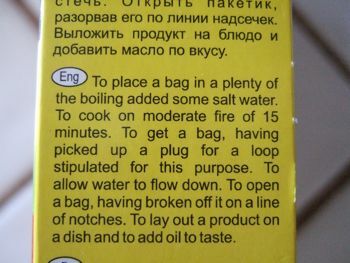 To cook on moderate fire of 15 minutes. To get a bag, having picked up a plug for a loop, stipulated for this purpose. To allow water to flow down. To open a bag, having broken off it on a line of notches. To lay out a product on a dish and add oil to taste. ÐŸÐ¾Ð¼ÐµÑÑ‚Ð¸Ñ‚ÑŒ Ð¿Ð°ÐºÐµÑ‚Ð¸Ðº Ð² Ð±Ð¾Ð»ÑŒÑˆÐ¾Ðµ ÐºÐ¾Ð»Ð¸Ñ‡ÐµÑÑ‚Ð²Ð¾ ÐºÐ¸Ð¿ÑÑ‰ÐµÐ¹ Ð¿Ð¾Ð´ÑÐ¾Ð»ÐµÐ½Ð½Ð¾Ð¹ Ð²Ð¾Ð´Ñ‹. Ð’Ð°Ñ€Ð¸Ñ‚ÑŒ Ð½Ð° ÑƒÐ¼ÐµÑ€ÐµÐ½Ð½Ð¾Ð¼ Ð¾Ð³Ð½Ðµ 15 Ð¼Ð¸Ð½ÑƒÑ‚. Ð”Ð¾ÑÑ‚Ð°Ñ‚ÑŒ Ð¿Ð°ÐºÐµÑ‚Ð¸Ðº, Ð¸, Ð¿Ð¾Ð´Ñ†ÐµÐ¿Ð¸Ð² Ð²Ð¸Ð»ÐºÐ¾Ð¹ Ð·Ð° Ð¿ÐµÑ‚Ð»ÑŽ, Ð¿Ñ€ÐµÐ´ÑƒÑÐ¼Ð¾Ñ‚Ñ€ÐµÐ½Ð½ÑƒÑŽ Ð´Ð»Ñ ÑÑ‚Ð¾Ð¹ Ñ†ÐµÐ»Ð¸, Ð´Ð°Ñ‚ÑŒ Ð²Ð¾Ð´Ðµ ÑÑ‚ÐµÑ‡ÑŒ. ÐžÑ‚ÐºÑ€Ñ‹Ñ‚ÑŒ Ð¿Ð°ÐºÐµÑ‚Ð¸Ðº, Ñ€Ð°Ð·Ð¾Ñ€Ð²Ð°Ð² ÐµÐ³Ð¾ Ð¿Ð¾ Ð»Ð¸Ð½Ð¸Ð¸ Ð½Ð°Ð´ÑÐµÑ‡ÐµÐº. Ð’Ñ‹Ð»Ð¾Ð¶Ð¸Ñ‚ÑŒ Ð¿Ñ€Ð¾Ð´ÑƒÐºÑ‚ Ð½Ð° Ð±Ð»ÑŽÐ´Ð¾ Ð¸ Ð´Ð¾Ð±Ð°Ð²Ð¸Ñ‚ÑŒ Ð¼Ð°ÑÐ»Ð¾ Ð¿Ð¾ Ð²ÐºÑƒÑÑƒ. 1. Can you find the words for three consecutive days without using Monday, Tuesday Wednesday, Thursday, Friday, Saturday, or Sunday? 2. This thing has five fingers, but it isn’t alive. What is it? 3. What is white when its dirty and black when its clean? 4. This belongs to you. Other people use it very often when they are with you, but you don’t. What is it? The teacher then wraps a piece of paper around this. It can be a piece of scratch paper, newspaper, whatever. Around that, wrap another piece of paper. Keep doing this until there are ten or fifteen layers of paper around the Surprise. The game is rather like musical chairs. Students stand in a circle. They pass the Paper-Wrapped Surprise around between them. The teacher plays music. Then she abruptly stops the music. Whoever is holding the Paper-Wrapped Surprise at that moment unwraps the outer piece of paper. (You don’t have to play music. An egg timer works great too). The student who removes the last piece of paper wins the Surprise. But we can do more. Let’s add a task each time a student unwraps a piece of paper. One way to do this is to give each student a piece of paper BEFORE the game is played and ask them to write, say, a personal opinion question (“What is your favorite kind of ice cream?”), or a time question (What time you get home from school/work every day?). Just give students some guidance with their questions so that they don’t all ask the same thing. So, in this version of the game, the student who unwraps the paper, looks at it, and directs that question to someone else in the group. Now, we have some speaking involved at every step of the game (and writing practice beforehand). If that sounds too simple for your adult class. Make the task more challenging. Try a “Name Three Things” task, where, on each paper, is written something like “Name Three Things People Do at a Wedding,” or “Name Three Things You Would do if you were in Tokyo.” (This will increase the amount of spoken language in the task.). The kinds of tasks that can be done at each stage of paper unwrapping are virtually unlimited. => Where to find songs? This activity has many steps, but that’s what makes it good. Students are challenged to use several skills along the way: translation, composition, correction, listening closely. And then there are interpersonal skills like negotiation, discussion, comparison, speculation. Time: 30 minutes.Â Depends on the length of the song lyric. (1) Recording of a song. You can use the song “True Love” (1:18) if you want. You’ll find a free downloadable mp3 of it at the bottom of this post, sung by me and my mum. (There she is, to the right, in 1946 at the age of 22. )Â But any song or poem will work, of course. (3) Blackboard, whiteboard, or poster paper. Find an English language song. It should be a song the students donâ€™t know. It shouldn’t be too long. You’ll need the lyrics and an audio. Translate the lyrics FROM English to the L1 of the students using a computer translator. Let your students know it’s a computer translation, but they should try to make the best English they can out of it. You’ll see that the translation comes out kind of funky. Here’s a Russian translation of the Cole Porter song “True Love.” (For the English lyrics see below). I suspect they are funny too, although I don’t read Japanese or Arabic. 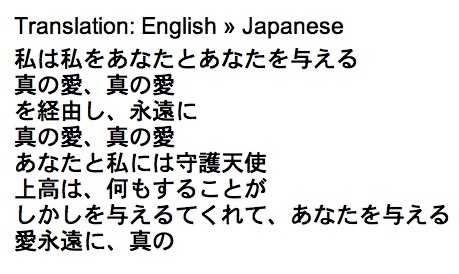 Then paste the various translations into your Word document. Print and distribute to the appropriate pairs and groups.It doesn’t take long to do even seven or eight computer translations, and you don’t mind because you’re such a good teacher, and you love making really interesting and useful activities. Distribute handouts of the translated song (NOT the English version), one per group. Groups will work together, translating the song into English. Take a moments to compare the several translations. Students may want to talk about the differences. Give a piece of chalk or a marker to one student from each group. These students will stand at the board next to their group’s translation. Announce that–at last–you are going to play a recording of the English language version of the song. The students’ job is now to listen very closely, to compare the original English version with the translation that they have written. The standing students will make corrections, trying to make the translated version exactly like the original. Members of these students’ groups will help by advising (or shouting) from their desks. Do not stop the song. Play it all the way through. Does any group have the English version rendered exactly? If not, play the song again. Give groups another chance at listening. Discuss changes and corrections. If the song is short, you may even want to play it a third time. By now, everyone knows the words, and they are written for all to see. Play the audio and have the class sing along. You can use any song. Iâ€™ll you need is a recording of it and the original lyrics. Simple songs work best, of two minutes or less. A long song would be strictly for advanced learners. Try English Teachers Everywhere (www.etseverywhere.com). Youâ€™ll find tons of songs, for adults, teens, and kids. Free Kids Music has some cool songs, free to download, but you’ll have to write down the lyrics yourself. Or use “True Love” below. Scavengers are animals that find and eat dead animals. These include vultures, beetles, and raccoons. Scavenger comes from a Middle English word, skawager, which was, actually, a customs collector. (You can see what people think of tax collectors!). Ordinary people can scavenge too: meaning collect things by searching through a bunch of old stuff. “A scavenger hunt is a game in which individuals or teams seek to find a number of specific items, or perform tasks, as given in a list. The goal is either to complete the list first, or to complete the list in the most creative manner.” (Definition from wikipedia). Elsa Maxwell (1883-1963), an American author, songwriter and professional hostess is credited with developing scavenger hunts and treasure hunts as party games. The press called her â€œthe Hostess with the Mostest.â€ (Thatâ€™s most-est, a non-grammatical superlative form of the word most.) Giving parties was what she was most famous for. 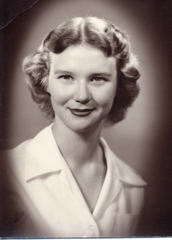 Of her life and success she said,”not bad, for a short, fat, homely piano player from Keokuk, Iowa, with no money or background, who decided to become a legend and did just that.” (Homely is a polite word for ugly). Scavenger Hunts are great language activities because they’re easy, quick, and fun, and they put students in the center of the action. Students work together, organizing their searches. They practice skimming or scanning, a useful reading skill. They use their imaginations and interpret things. You can even ask students to make their own lists of things to be scavenged, once they understand how the game works. You will need some magazines, five to ten per group. But you can add newspapers, books, posters, adverts, postcards, decorations on the classroom wall, etc. Itâ€™s best if these are in English. But they donâ€™t have to be. This is a race. Each group will look through all their materials trying to find all items in the list. The first team to find all 10 is the winner. (They will need to show where they found them). Tip: If you live in the U.S., public libraries or recycle outlets often have bins of magazines for the taking. Grab 30 or 40 for your classroom. If you live overseas, ask your friendly neighborhood foreigner to donate old magazines. Or try your U.S., Canadian, British, Irish, Aussie, Kiwi embassies for material. Yes, itâ€™s possible that some of these things wonâ€™t be found. Thatâ€™s okay. Whichever team finds the most wins. 1. What is the Alamo? 2. Who invented the skateboard? When and Where? And so on. Each group will go to the Internet, and try to answer all the assigned questions. Once again, itâ€™s a race. Thanks to Nadya Solovyova in Obninsk for reminding me to publish ETs in Russia. Allow fifteen minutes, including directions and demonstration. Partners exchange papers. Now each person has a question to answer. This answer should be 6 words. The person will write the answer beneath the question. Exchange papers again: on the return of his/her own paper, each student writes a five word response, and so on. Merdan: You should. (2 words). For this to work well, it is wise to make demonstrations. For instance, the teacher can get an outgoing student and the two can do the first tapering dialogue on the border. Contractions count as one word: “I’m.” “Can’t.” “Won’t,” etc. Advanced students can really explore English short cuts, like “whaddaya,” “coulda” “wanna,” “gonna,” “d’ya,” etc. Thank you Mario, for this great activity. Make this a three-way writing task instead of just two… Could it be done? What are the advantage/ disadvantages? Do you need the 7 words to one-word tapering aspect? Try the activity a second time. This time allow student to make seven sentences of any word length. Ask your students which activity works better. If you have a laptop with recording software, ask a pair of students to go outside and record their tapering dialog. When they come back in, play the audio file, and have the rest of the class write down the conversation. Then ask what variations could take place with each line. (Recording with your computer’s built-in mic is really easy. Try http://audacity.sourceforge.net/). Ð Ð¾ÑÑÐ¸Ñ â€“ ÑÑ‚Ñ€Ð°Ð½Ð° Ð¶ÐµÐ½Ñ‰Ð¸Ð½. ÐŸÐ¾ ÐºÑ€Ð°Ð¹Ð½ÐµÐ¹ Ð¼ÐµÑ€Ðµ, Ñ‚Ð°Ðº Ð±Ñ‹Ð»Ð¾ Ð´Ð»Ñ Ð¼ÐµÐ½Ñ. Ð¯ Ñ€Ð°Ð±Ð¾Ñ‚Ð°Ð» Ð¿Ñ€ÐµÐ¿Ð¾Ð´Ð°Ð²Ð°Ñ‚ÐµÐ»ÐµÐ¼ Ð´Ð»Ñ ÑƒÑ‡Ð¸Ñ‚ÐµÐ»ÐµÐ¹ Ð² Ð³Ð¾Ñ€Ð¾Ð´Ðµ Ð¡Ð°Ð¼Ð°Ñ€Ðµ, Ð¸ Ð´ÐµÐ²ÑÐ½Ð¾ÑÑ‚Ð¾ Ð¿Ñ€Ð¾Ñ†ÐµÐ½Ñ‚Ð¾Ð² Ð² ÑÑ‚Ð¾Ð¹ ÑÑ„ÐµÑ€Ðµ ÑÐ¾ÑÑ‚Ð°Ð²Ð»ÑÐ»Ð¸ Ð¶ÐµÐ½Ñ‰Ð¸Ð½Ñ‹. Ð’ Ð½Ð°ÑˆÐµÐ¼ Ð¾Ñ„Ð¸ÑÐµ Ð¼Ð¾Ñ Ð½Ð°Ñ‡Ð°Ð»ÑŒÐ½Ð¸Ñ†Ð° Ð¸ ÐºÐ¾Ð»Ð»ÐµÐ³Ð¸ Ð±Ñ‹Ð»Ð¸ Ð¶ÐµÐ½Ñ‰Ð¸Ð½Ñ‹. ÐžÑ„Ð¸Ñ†Ð¸Ð°Ð½Ñ‚ÐºÐ¸ ÐºÐ°Ñ„Ðµ Ð¸ ÐºÐ°ÑÑÐ¸Ñ€ÑˆÐ¸ Ð³Ð°ÑÑ‚Ñ€Ð¾Ð½Ð¾Ð¼Ð° Ð±Ñ‹Ð»Ð¸, ÐºÐ°Ðº Ð¿Ñ€Ð°Ð²Ð¸Ð»Ð¾, Ð¶ÐµÐ½Ñ‰Ð¸Ð½Ð°Ð¼Ð¸. ÐšÐ¾Ð³Ð´Ð° Ñ ÑÑ‚Ð°Ð»ÐºÐ¸Ð²Ð°Ð»ÑÑ Ñ ÑÐ¾ÑÐµÐ´ÑÐ¼Ð¸ Ð¿Ð¾ Ð»ÐµÑÑ‚Ð½Ð¸Ñ‡Ð½Ð¾Ð¹ Ð¿Ð»Ð¾Ñ‰Ð°Ð´ÐºÐµ, ÑÑ‚Ð¾ Ð±Ñ‹Ð»Ð¸ Ð¶ÐµÐ½Ñ‹ Ð¸ Ð´Ð¾Ñ‡ÐµÑ€Ð¸. ÐšÐ°Ð·Ð°Ð»Ð¾ÑÑŒ Ð´Ð°Ð¶Ðµ, Ñ‡Ñ‚Ð¾ Ð½Ð° Ñ€Ð¾Ð¼Ð°Ð½Ñ‚Ð¸Ñ‡ÐµÑÐºÐ¾Ð¹ Ð½Ð°Ð±ÐµÑ€ÐµÐ¶Ð½Ð¾Ð¹ Ð’Ð¾Ð»Ð³Ð¸ Ð´ÐµÐ²ÑƒÑˆÐµÐº Ð³ÑƒÐ»ÑÐµÑ‚ Ð±Ð¾Ð»ÑŒÑˆÐµ, Ñ‡ÐµÐ¼ Ð²Ð»ÑŽÐ±Ð»ÐµÐ½Ð½Ñ‹Ñ…. Ð’Ð¼ÐµÑÑ‚Ð¾ Ð¾ÑÐ¼Ð¾Ñ‚Ñ€Ð° Ð´Ð¾ÑÑ‚Ð¾Ð¿Ñ€Ð¸Ð¼ÐµÑ‡Ð°Ñ‚ÐµÐ»ÑŒÐ½Ð¾ÑÑ‚ÐµÐ¹ â€“ Ð¿Ð¾Ñ‚Ð¾Ð¼Ñƒ, Ñ‡Ñ‚Ð¾ Ð½Ð°ÑÑ‚Ð¾ÑÑ‰Ð¸Ñ… Ð¸Ð½Ñ‚ÐµÑ€ÐµÑÐ½Ñ‹Ñ… Ð¼ÐµÑÑ‚ Ð±Ñ‹Ð»Ð¾ Ð¼Ð°Ð»Ð¾ â€“ Ñ, Ð±Ñ‹Ð²Ð°Ð»Ð¾, Ð¿Ð¾ÐºÑƒÐ¿Ð°Ð» Ñ‚Ñ€Ð°Ð¼Ð²Ð°Ð¹Ð½Ñ‹Ð¹ Ð±Ð¸Ð»ÐµÑ‚ Ð·Ð° Ñ‚Ñ€Ð¸ Ñ€ÑƒÐ±Ð»Ñ Ð¸ ÐºÐ°Ñ‚Ð°Ð»ÑÑ Ð¿Ð¾ Ð²ÑÐµÐ¼Ñƒ Ð¼Ð°Ñ€ÑˆÑ€ÑƒÑ‚Ñƒ. ÐÐ°Ñ†Ð¸ÑÑ‚Ñ‹ Ñ‚Ð°Ðº Ð¸ Ð½Ðµ Ð¿ÐµÑ€ÐµÑˆÐ»Ð¸ Ð’Ð¾Ð»Ð³Ñƒ Ð¸ Ð½Ðµ Ñ€Ð°Ð·Ñ€ÑƒÑˆÐ¸Ð»Ð¸ Ð¡Ð°Ð¼Ð°Ñ€Ñƒ, Ð¸ Ð² Ñ€ÐµÐ·ÑƒÐ»ÑŒÑ‚Ð°Ñ‚Ðµ, Ð¾Ð´Ð½Ð¾Ñ‚Ð¸Ð¿Ð½Ñ‹Ðµ Ñ€ÑÐ´Ñ‹ ÑÐ¾Ð²ÐµÑ‚ÑÐºÐ¸Ñ… ÐºÐ²Ð°Ñ€Ñ‚Ð°Ð»Ð¾Ð², Ð½Ð°Ð²Ð¾Ð´Ð½Ð¸Ð²ÑˆÐ¸Ðµ Ð²Ð½Ð¾Ð²ÑŒ Ð¾Ñ‚ÑÑ‚Ñ€Ð¾ÐµÐ½Ð½Ñ‹Ðµ Ð³Ð¾Ñ€Ð¾Ð´Ð°, Ð²Ð½ÐµÐ·Ð°Ð¿Ð½Ð¾ Ð¾Ñ‚ÐºÑ€Ñ‹Ð²Ð°Ð»Ð¸ Ð¿ÐµÐ¹Ð·Ð°Ð¶Ð¸ ÑÑ‚Ð¾Ð»ÐµÑ‚Ð½ÐµÐ¹ Ð´Ð°Ð²Ð½Ð¾ÑÑ‚Ð¸: Ð¸Ð·Ñ€Ñ‹Ñ‚Ñ‹Ðµ Ð³Ñ€ÑÐ·Ð½Ñ‹Ð¼Ð¸ ÐºÐ¾Ð»ÐµÑÐ¼Ð¸ Ð´Ð¾Ñ€Ð¾Ð³Ð¸, ÐºÐ¾Ñ‚Ð¾Ñ€Ñ‹Ðµ Ð²Ð¸Ð»Ð¸ÑÑŒ Ð¼Ð¸Ð¼Ð¾ Ð¿Ð¾ÐºÐ¾ÑÐ¸Ð²ÑˆÐ¸Ñ…ÑÑ Ð´ÐµÑ€ÐµÐ²ÑÐ½Ð½Ñ‹Ñ… Ð´Ð¾Ð¼Ð¸ÑˆÐµÐº Ñ ÐºÐ¾Ð»Ð¾Ð´Ñ†Ð°Ð¼Ð¸ Ð¸ Ð´Ñ€ÐµÐ¼Ð»ÑŽÑ‰Ð¸Ð¼Ð¸ ÑÐ¾Ð±Ð°ÐºÐ°Ð¼Ð¸. Ð”Ð»Ñ Ð¿Ð¾ÐµÐ·Ð´Ð¾Ðº Ð²ÐµÑÐ½Ð° – Ð»ÑƒÑ‡ÑˆÐµÐµ Ð²Ñ€ÐµÐ¼Ñ. Ð˜Ð· Ð¾ÐºÐ½Ð° Ñ Ð²Ð¸Ð´ÐµÐ», ÐºÐ°Ðº Ð¿Ð¾Ñ‡ÐºÐ¸ Ð½Ð° Ð²ÐµÑ‚Ð²ÑÑ… Ð´ÐµÑ€ÐµÐ²ÑŒÐµÐ² Ð½Ð°Ð»Ð¸Ð²Ð°Ð»Ð¸ÑÑŒ, Ð³Ð¾Ñ‚Ð¾Ð²ÑÑÑŒ Ð»Ð¾Ð¿Ð½ÑƒÑ‚ÑŒ Ð¸ Ð²Ñ‹Ð¿ÑƒÑÑ‚Ð¸Ñ‚ÑŒ Ð·ÐµÐ»ÐµÐ½Ñ‹Ðµ Ð»Ð¸ÑÑ‚ÑŒÑ. Ð˜ ÐºÑ€ÑƒÐ³Ð¾Ð¼ Ð±Ñ‹Ð»Ð¾ Ñ‚Ð°Ðº Ð¼Ð½Ð¾Ð³Ð¾ Ð´ÐµÐ²ÑƒÑˆÐµÐº! Ð”ÐµÑ€Ð¶Ð°ÑÑŒ Ð·Ð° Ñ€ÑƒÐºÐ¸, Ð¾Ð½Ð¸ Ñ„Ð»Ð°Ð½Ð¸Ñ€Ð¾Ð²Ð°Ð»Ð¸ Ð½Ð° Ð²Ñ‹ÑÐ¾ÐºÐ¸Ñ… ÐºÐ°Ð±Ð»ÑƒÑ‡ÐºÐ°Ñ… Ð¿Ð¾ Ñ€Ð°Ð·Ð±Ð¸Ñ‚Ñ‹Ð¼ Ð²Ñ‹Ñ‰ÐµÑ€Ð±Ð»ÐµÐ½Ð½Ñ‹Ð¼ Ñ‚Ñ€Ð¾Ñ‚ÑƒÐ°Ñ€Ð°Ð¼, ÐµÐ»Ð¸ Ð¼Ð¾Ñ€Ð¾Ð¶ÐµÐ½Ð¾Ðµ Ð¸Ð»Ð¸ Ð¿Ð¸Ð»Ð¸ Ð¿Ð¸Ð²Ð¾ Ð¸Ð· Ð±ÑƒÑ‚Ñ‹Ð»Ð¾Ðº. ÐžÐ½Ð¸ ÐµÐ·Ð´Ð¸Ð»Ð¸ Ð½Ð° Ñ‚Ñ€Ð°Ð¼Ð²Ð°ÑÑ… Ð² Ð²ÐµÑÐµÐ½Ð½Ð¸Ñ… Ð¿Ð»Ð°Ñ‚ÑŒÑÑ…, Ð´ÐµÑ€Ð¶Ð° Ð±ÑƒÐºÐµÑ‚Ñ‹ Ñ†Ð²ÐµÑ‚Ð¾Ð² Ð² ÐµÑ‰Ðµ Ð½Ðµ Ð·Ð°Ð³Ð¾Ñ€ÐµÐ»Ñ‹Ñ… Ñ€ÑƒÐºÐ°Ñ…. Ð Ð°Ð·Ð¾Ðºâ€“Ð´Ñ€ÑƒÐ³Ð¾Ð¹ Ñ Ð²Ñ‹Ñ…Ð¾Ð´Ð¸Ð» Ð¸Ð· Ñ‚Ñ€Ð°Ð¼Ð²Ð°Ñ Ð²ÑÐ»ÐµÐ´ Ð·Ð° ÐºÐ°ÐºÐ¾Ð¹-Ð½Ð¸Ð±ÑƒÐ´ÑŒ Ð´ÐµÐ²ÑƒÑˆÐºÐ¾Ð¹ Ñ Ð¼Ð°Ð½ÑÑ‰Ð¸Ð¼Ð¸ Ð³Ð»Ð°Ð·Ð°Ð¼Ð¸, Ð¿Ñ€ÐµÐ´Ð¾ÑÑ‚Ð°Ð²Ð»ÑÑ ÐµÐ¹ Ð²Ð¾Ð·Ð¼Ð¾Ð¶Ð½Ð¾ÑÑ‚ÑŒ Ð²ÐµÑÑ‚Ð¸ Ð¼ÐµÐ½Ñ ÐºÑƒÐ´Ð° ÑƒÐ³Ð¾Ð´Ð½Ð¾; Ñ‚Ð°Ðº Ð”Ð¾Ð½ ÐšÐ¸Ñ…Ð¾Ñ‚ ÑˆÐµÐ» Ð·Ð° ÑÐ²Ð¾Ð¸Ð¼ Ð Ð¾ÑÐ¸Ð½Ð°Ð½Ñ‚Ð¾Ð¼. ÐžÐºÐ°Ð·Ð°Ð»Ð°ÑÑŒ, Ð½Ðµ Ñ ÐµÐ´Ð¸Ð½ÑÑ‚Ð²ÐµÐ½Ð½Ñ‹Ð¹ Ð·Ð°Ð½Ð¸Ð¼Ð°Ð»ÑÑ Ð¿Ð¾Ð´Ð¾Ð±Ð½Ñ‹Ð¼Ð¸ Ð¸ÑÑÐ»ÐµÐ´Ð¾Ð²Ð°Ð½Ð¸ÑÐ¼Ð¸. ÐžÐ´Ð½Ð°Ð¶Ð´Ñ‹ ÑÐ¾Ð»Ð½ÐµÑ‡Ð½Ñ‹Ð¼ Ð´Ð½ÐµÐ¼, ÐºÐ¾Ð³Ð´Ð° Ð²Ñ‹ÑÐ¾Ñ…ÑˆÐ°Ñ Ð¿Ð¾ÑÐ»Ðµ Ð²ÐµÑÐµÐ½Ð½ÐµÐ³Ð¾ Ñ‚Ð°ÑÐ½Ð¸Ñ Ð³Ñ€ÑÐ·ÑŒ Ð²Ñ‹ÑÐ¾Ñ…Ð»Ð° Ð¸ ÑÐ»Ð¾ÐµÐ¼ Ð¿Ð¾ÐºÑ€Ñ‹Ð²Ð°Ð»Ð° ÑƒÐ»Ð¸Ñ†Ñ‹, Ñ Ð²ÑÑ‚Ñ€ÐµÑ‚Ð¸Ð» Ð±ÐµÐ»Ð¾Ð³Ð¾ Ð¿ÑÐ°, ÐµÑ…Ð°Ð²ÑˆÐµÐ³Ð¾ Ð½Ð° Ñ‚Ñ€Ð°Ð¼Ð²Ð°Ðµ Ð½Ð¾Ð¼ÐµÑ€ 18. Ð‘Ñ‹Ð»Ð¾ Ð²Ð¾ÑÐºÑ€ÐµÑÐµÐ½ÑŒÐµ, Ñ‚Ð°Ðº Ñ‡Ñ‚Ð¾ Ñ‚Ñ€Ð°Ð¼Ð²Ð°Ð¹ Ð½Ðµ Ð±Ñ‹Ð» Ð¿ÐµÑ€ÐµÐ¿Ð¾Ð»Ð½ÐµÐ½ â€“ Ð²ÑÐµÐ³Ð¾ Ð½ÐµÑÐºÐ¾Ð»ÑŒÐºÐ¾ Ñ‡ÐµÐ»Ð¾Ð²ÐµÐº Ð½Ð° Ð·Ð°Ð´Ð½ÐµÐ¹ Ð¿Ð»Ð¾Ñ‰Ð°Ð´ÐºÐµ. ÐÐµÐ±Ñ€Ð¸Ñ‚Ñ‹Ð¹ Ð¼ÑƒÐ¶Ñ‡Ð¸Ð½Ð° Ð·Ð°Ð½ÑÐ» Ð¾Ð´Ð½Ð¾ Ð¸Ð· Ñ‚Ñ€ÐµÑ… Ð¿Ð»Ð°ÑÑ‚Ð¸ÐºÐ¾Ð²Ñ‹Ñ… ÐºÑ€ÐµÑÐµÐ» Ð²Ð¾Ð·Ð»Ðµ Ð·Ð°Ð´Ð½ÐµÐ³Ð¾ Ð¾ÐºÐ½Ð°; Ñƒ Ð½ÐµÐ³Ð¾ Ð½Ð° Ð¿Ð»ÐµÑ‡Ð°Ñ… Ð±Ð¾Ð»Ñ‚Ð°Ð»ÑÑ Ñ‚ÐµÐ¼Ð½Ñ‹Ð¹ Ð¿Ð¸Ð´Ð¶Ð°Ðº. Ð’ ÑÐ²ÑÐ·Ð¸ Ñ Ð½Ð°ÑÑ‚ÑƒÐ¿Ð»ÐµÐ½Ð¸ÐµÐ¼ Ð²ÐµÑÐµÐ½Ð½ÐµÐ³Ð¾ ÑÐµÐ·Ð¾Ð½Ð° Ð² Ð³Ð¾Ñ€Ð¾Ð´Ðµ Ð¾Ñ‚ÐºÐ»ÑŽÑ‡Ð¸Ð»Ð¸ Ð³Ð¾Ñ€ÑÑ‡ÑƒÑŽ Ð²Ð¾Ð´Ñƒ, Ð¸ Ð¾Ñ‚ Ð½ÐµÐ³Ð¾ Ð¿Ð°Ñ…Ð»Ð¾ Ð½ÐµÐ¼Ñ‹Ñ‚Ñ‹Ð¼ Ñ‚ÐµÐ»Ð¾Ð¼. Ð‘Ñ‹Ð»Ð° Ñ‚Ð°ÐºÐ¶Ðµ Ð¶ÐµÐ½Ñ‰Ð¸Ð½Ð° Ð² Ð³Ñ€Ð¾Ð¼Ð¾Ð·Ð´ÐºÐ¾Ð¼ Ð¿Ð»Ð°Ñ‰Ðµ â€“ Ð½ÐµÐ´Ð¾Ð²ÐµÑ€Ñ‡Ð¸Ð²Ð°Ñ Ðº Ð¿Ñ€ÐµÐºÑ€Ð°ÑÐ½Ð¾Ð¹ Ð¿Ð¾Ð³Ð¾Ð´Ðµ Ð¸ Ð¾Ð¶Ð¸Ð´Ð°ÑŽÑ‰Ð°Ñ, Ñ‡Ñ‚Ð¾ Ð¾Ð½Ð° Ð·Ð°ÐºÐ¾Ð½Ñ‡Ð¸Ñ‚ÑÑ. ÐžÐ´Ð½Ð¾Ð¹ Ñ€ÑƒÐºÐ¾Ð¹ Ð¾Ð½Ð° ÑÐ¶Ð¸Ð¼Ð°Ð»Ð° Ð¿Ð¾Ñ€ÑƒÑ‡ÐµÐ½ÑŒ Ð½Ð°Ð´ Ð³Ð¾Ð»Ð¾Ð²Ð¾Ð¹, Ð° Ð´Ñ€ÑƒÐ³Ð¾Ð¹ â€“ Ð¿Ð»Ð°ÑÑ‚Ð¸ÐºÐ¾Ð²Ñ‹Ð¹ Ð¿Ð°ÐºÐµÑ‚ Ñ Ð¾Ð²Ð¾Ñ‰Ð°Ð¼Ð¸ Ð¸ Ð·Ð°Ð²ÐµÑ€Ð½ÑƒÑ‚Ñ‹Ð¹ Ð² Ð³Ð°Ð·ÐµÑ‚Ñƒ Ð±ÑƒÐºÐµÑ‚Ð¸Ðº Ð»Ð°Ð½Ð´Ñ‹ÑˆÐµÐ¹. ÐœÐµÐ¶Ð´Ñƒ Ð½Ð¸Ð¼Ð¸ Ð±Ñ‹Ð» Ð±ÐµÐ»Ñ‹Ð¹ Ð¿ÐµÑ. Ð¨ÐµÑ€ÑÑ‚ÑŒ Ñƒ Ð½ÐµÐ³Ð¾ Ð±Ñ‹Ð»Ð° Ð¶ÐµÑÑ‚ÐºÐ°Ñ, Ð° Ð²Ð½Ð¸Ð·Ñƒ Ð¶Ð¸Ð²Ð¾Ñ‚Ð° â€“ Ð³Ñ€ÑƒÐ±Ð°Ñ, ÐºÐ°Ðº Ñƒ ÐºÐ°Ð±Ð°Ð½Ð°. Ð’Ð¾ÐºÑ€ÑƒÐ³ Ð³Ð»Ð°Ð· Ð±Ñ‹Ð»Ð¸ Ð±Ð¾Ð»ÑÑ‡ÐºÐ¸, Ð½Ð¾ Ð³Ð»Ð°Ð·Ð° Ð±Ñ‹Ð»Ð¸ ÑÐ¿Ð¾ÐºÐ¾Ð¹Ð½Ñ‹Ðµ Ð¸ ÐºÐ°ÐºÐ¸Ðµ-Ñ‚Ð¾ ÑƒÐ²Ð°Ð¶Ð¸Ñ‚ÐµÐ»ÑŒÐ½Ñ‹Ðµ. ÐžÐ½ Ð¿ÐµÑ€ÐµÐ²Ð¾Ð´Ð¸Ð» Ð¸Ñ… Ñ Ð¾Ð´Ð½Ð¾Ð³Ð¾ Ð¿Ð°ÑÑÐ°Ð¶Ð¸Ñ€Ð° Ð½Ð° Ð´Ñ€ÑƒÐ³Ð¾Ð³Ð¾ Ð¸, Ð½Ð°ÐºÐ¾Ð½ÐµÑ†, ÑƒÑÑ‚Ð°Ð²Ð¸Ð»ÑÑ Ð½Ð° ÐºÐ°ÐºÐ¾Ð¹-Ñ‚Ð¾ Ð½ÐµÐ¹Ñ‚Ñ€Ð°Ð»ÑŒÐ½Ñ‹Ð¹ Ð¿Ñ€ÐµÐ´Ð¼ÐµÑ‚. Â«Ð¡ ÐºÐµÐ¼ Ð¾Ð½?Â»,- ÑÐ¿Ñ€Ð¾ÑÐ¸Ð» Ñ ÑÐ°Ð¼ ÑÐµÐ±Ñ. ÐÐµÐ±Ñ€Ð¸Ñ‚Ñ‹Ð¹ Ð¼ÑƒÐ¶Ð¸Ðº Ð¿Ð¾ÑÑ‚Ð°Ð²Ð¸Ð» Ð»Ð¾ÐºÑ‚Ð¸ Ð½Ð° ÐºÐ¾Ð»ÐµÐ½Ð¸, Ð° ÐµÐ³Ð¾ Ð¿Ð»ÐµÑ‡Ð¸ Ð¿Ð¾ÐºÐ°Ñ‡Ð¸Ð²Ð°Ð»Ð¸ÑÑŒ Ð² Ñ‚Ð°ÐºÑ‚ Ð´Ð²Ð¸Ð¶ÐµÐ½Ð¸ÑŽ Ñ‚Ñ€Ð°Ð¼Ð²Ð°Ñ. ÐžÐ½ Ð·Ð°Ð¼ÐµÑ‚Ð¸Ð», Ñ‡Ñ‚Ð¾ Ñ Ð½Ð°Ð±Ð»ÑŽÐ´Ð°ÑŽ Ð·Ð° ÑÐ¾Ð±Ð°ÐºÐ¾Ð¹. ÐžÑ‡Ð°Ñ€Ð¾Ð²Ð°Ñ‚ÐµÐ»ÑŒÐ½Ð°Ñ ÑÐ¾Ð±Ð°ÐºÐ°? Ð¯ ÐºÐ¸Ð²Ð½ÑƒÐ»: ÐºÐ¾Ð½ÐµÑ‡Ð½Ð¾. Ð–ÐµÐ½Ñ‰Ð¸Ð½Ð° Ð² Ð¿Ð»Ð°Ñ‰Ðµ Ð´Ð²Ð¸Ð½ÑƒÐ»Ð°ÑÑŒ Ðº Ð´Ð²ÐµÑ€ÑÐ¼, Ð¸ Ñ‡ÐµÑ€ÐµÐ· ÑÐµÐºÑƒÐ½Ð´Ñƒ Ñ‚Ñ€Ð°Ð¼Ð²Ð°Ð¹ Ñ Ð»ÑÐ·Ð³Ð¾Ð¼ Ð¾ÑÑ‚Ð°Ð½Ð¾Ð²Ð¸Ð»ÑÑ. Ð‘Ð°Ð»Ð°Ð½ÑÐ¸Ñ€ÑƒÑ, Ð¿ÐµÑ Ð¿ÐµÑ€ÐµÐ¼ÐµÐ½Ð¸Ð» Ð¿Ð¾Ð»Ð¾Ð¶ÐµÐ½Ð¸Ðµ. Ð¨ÐµÑ€ÑÑ‚ÑŒ Ñƒ Ð½ÐµÐ³Ð¾ Ð½Ð° Ð±Ñ€ÑŽÑ…Ðµ ÑÐ²Ð°Ð»ÑÐ»Ð°ÑÑŒ Ð¾Ñ‚ Ð³Ñ€ÑÐ·Ð¸ Ð¸ Ñ‚Ð¾Ð¿Ð¾Ñ€Ñ‰Ð¸Ð»Ð°ÑÑŒ; Ð¼Ð¾Ð»Ð¾Ð´Ñ‹Ðµ Ð»ÑŽÐ´Ð¸ Ð´Ð¾Ð±Ð¸Ð²Ð°ÑŽÑ‚ÑÑ Ñ‚Ð¾Ð³Ð¾ Ð¶Ðµ Ñ Ð¿Ð¾Ð¼Ð¾Ñ‰ÑŒÑŽ Ð³ÐµÐ»Ñ. Ð”Ð²ÐµÑ€Ð¸ Ñ ÑˆÐ¸Ð¿ÐµÐ½Ð¸ÐµÐ¼ Ð¾Ñ‚Ð²Ð¾Ñ€Ð¸Ð»Ð¸ÑÑŒ. Ð–ÐµÐ½Ñ‰Ð¸Ð½Ð° ÑÐºÐ¾Ð»ÑŒÐ·Ð½ÑƒÐ»Ð° Ð²Ð½Ð¸Ð· Ð¿Ð¾ ÑÑ‚ÑƒÐ¿ÐµÐ½ÑŒÐºÐ°Ð¼, ÑÐ¶Ð¸Ð¼Ð°Ñ ÑÑƒÐ¼ÐºÑƒ Ð¸ Ð¿Ð¾Ñ€ÑƒÑ‡ÐµÐ½ÑŒ. ÐŸÐµÑ Ð¿Ð¾Ð´Ð¾Ð¶Ð´Ð°Ð», Ð¿Ð¾ÐºÐ° Ð¾Ð½Ð° ÑÐ¾Ð¹Ð´ÐµÑ‚ Ñ Ð¿Ð¾ÑÐ»ÐµÐ´Ð½ÐµÐ¹, ÑÐ°Ð¼Ð¾Ð¹ ÐºÑ€ÑƒÑ‚Ð¾Ð¹ ÑÑ‚ÑƒÐ¿ÐµÐ½Ð¸, Ð½Ð° Ñ‚Ñ€Ð¾Ñ‚ÑƒÐ°Ñ€, Ð¸ Ñ‚Ð¾Ð¶Ðµ Ð²Ñ‹ÑˆÐµÐ». Ð¯ ÑƒÑÐ»Ñ‹ÑˆÐ°Ð», Ñ‡Ñ‚Ð¾ Ð¾Ð½Ð° Ð³Ð¾Ð²Ð¾Ñ€Ð¸Ñ‚: Â«ÐÑƒ, Ð²ÑÐµ. ÐÐµ Ñ…Ð¾Ð´Ð¸ Ð·Ð° Ð¼Ð½Ð¾Ð¹. Ð£Ñ…Ð¾Ð´Ð¸Â». Ð’ Ð³Ñ€Ð¾Ð¼ÐºÐ¾Ð³Ð¾Ð²Ð¾Ñ€Ð¸Ñ‚ÐµÐ»Ðµ Ð¿Ð¾ÑÐ»Ñ‹ÑˆÐ°Ð»ÑÑ Ð¼ÐµÑ‚Ð°Ð»Ð»Ð¸Ñ‡ÐµÑÐºÐ¸Ð¹ Ð³Ð¾Ð»Ð¾Ñ Ð²Ð°Ð³Ð¾Ð½Ð¾Ð²Ð¾Ð¶Ð°Ñ‚Ð¾Ð³Ð¾: Â«ÐžÑÑ‚Ð¾Ñ€Ð¾Ð¶Ð½Ð¾. 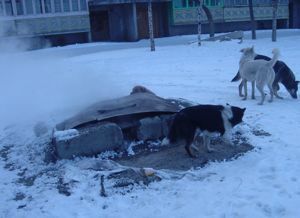 Ð”Ð²ÐµÑ€Ð¸ Ð·Ð°ÐºÑ€Ñ‹Ð²Ð°ÑŽÑ‚ÑÑÂ». Ð¢Ñ€Ð°Ð¼Ð²Ð°Ð¹ Ð´ÐµÑ€Ð½ÑƒÐ»ÑÑ Ð²Ð¿ÐµÑ€ÐµÐ´; Ð¸Ð· Ð·Ð°Ð´Ð½ÐµÐ³Ð¾ Ð¾ÐºÐ½Ð° Ñ ÑÐ¼Ð¾Ñ‚Ñ€ÐµÐ», ÐºÐ°Ðº Ð¶ÐµÐ½Ñ‰Ð¸Ð½Ð° Ð¿ÐµÑ€ÐµÑ…Ð¾Ð´Ð¸Ñ‚ ÑƒÐ»Ð¸Ñ†Ñƒ, Ð° Ð±ÐµÐ»Ñ‹Ð¹ Ð¿ÐµÑ Ð¸Ð´ÐµÑ‚ Ð·Ð° Ð½ÐµÐ¹ Ð½Ð° Ð¿Ð¾Ñ‡Ñ‚Ð¸Ñ‚ÐµÐ»ÑŒÐ½Ð¾Ð¼ Ñ€Ð°ÑÑÑ‚Ð¾ÑÐ½Ð¸Ð¸. Ð¯ Ð½Ðµ Ð´ÑƒÐ¼Ð°Ð» Ð¾ Ð±ÐµÐ»Ð¾Ð¼ Ð¿ÑÐµ ÐµÑ‰Ðµ Ð½ÐµÑÐºÐ¾Ð»ÑŒÐºÐ¾ Ð½ÐµÐ´ÐµÐ»ÑŒ. Ð¯ ÐµÑ…Ð°Ð» Ð½Ð° Ñ‚Ñ€Ð°Ð¼Ð²Ð°Ðµ, Ð° Ð¾Ð½ Ð²Ñ‹ÑˆÐ°Ð³Ð¸Ð²Ð°Ð» Ð¿Ð¾ Ñ‚Ñ€Ð¾Ñ‚ÑƒÐ°Ñ€Ñƒ. Ð­Ñ‚Ð¾ Ð±Ñ‹Ð»Ð¾ Ð´Ð°Ð»ÐµÐºÐ¾ Ð¾Ñ‚ Ñ‚Ð¾Ð³Ð¾ Ð¼ÐµÑÑ‚Ð°, Ð³Ð´Ðµ Ñ Ð²Ð¿ÐµÑ€Ð²Ñ‹Ðµ ÐµÐ³Ð¾ Ð²ÑÑ‚Ñ€ÐµÑ‚Ð¸Ð», Ð½Ð¾ â€“ Ð¿Ð¾Ð´ÑƒÐ¼Ð°Ð»Ð¾ÑÑŒ Ð¼Ð½Ðµ â€“ Ð²ÑÐµ Ð¶Ðµ, Ð²Ð´Ð¾Ð»ÑŒ Ñ‚Ñ€Ð°Ð¼Ð²Ð°Ð¹Ð½Ð¾Ð¹ Ð»Ð¸Ð½Ð¸Ð¸. ÐÐµÑƒÐ¶ÐµÐ»Ð¸ Ð±ÐµÐ»Ñ‹Ð¹ Ð¿ÐµÑ Ð´ÐµÐ¹ÑÑ‚Ð²Ð¸Ñ‚ÐµÐ»ÑŒÐ½Ð¾ ÐµÐ·Ð´Ð¸Ñ‚ Ð¿Ð¾ Ð³Ð¾Ñ€Ð¾Ð´Ñƒ Ð½Ð° Ñ‚Ñ€Ð°Ð¼Ð²Ð°ÑÑ…? ÐœÐ½Ðµ Ð¿Ñ€Ð¸Ñ…Ð¾Ð´Ð¸Ð»Ð¾ÑÑŒ Ð²Ð¸Ð´ÐµÑ‚ÑŒ ÑÐ¾Ð±Ð°Ðº, ÐºÐ¾Ñ‚Ð¾Ñ€Ñ‹Ðµ Ð¶Ð´Ð°Ð»Ð¸ Ð½ÑƒÐ¶Ð½Ð¾Ð³Ð¾ Ð¾Ð³Ð½Ñ ÑÐ²ÐµÑ‚Ð¾Ñ„Ð¾Ñ€Ð° Ð½Ð° Ð¾Ð¿Ð°ÑÐ½Ñ‹Ñ… Ð¿ÐµÑ€ÐµÐºÑ€ÐµÑÑ‚ÐºÐ°Ñ… Ð¸ ÑÐ¼Ð¾Ñ‚Ñ€ÐµÐ»Ð¸ Ð½Ð°Ð»ÐµÐ²Ð¾ Ð¸ Ð½Ð°Ð¿Ñ€Ð°Ð²Ð¾ Ð¿ÐµÑ€ÐµÐ´ Ñ‚ÐµÐ¼, ÐºÐ°Ðº Ð¿ÐµÑ€ÐµÐ¹Ñ‚Ð¸ ÑƒÐ»Ð¸Ñ†Ñƒ. ÐŸÐ¾ÑÑ‚Ð¾Ð¼Ñƒ Ð¿Ð¾ÐµÐ·Ð´ÐºÐ¸ Ð² Ñ‚Ñ€Ð°Ð¼Ð²Ð°ÑÑ… Ð½Ðµ Ð±Ñ‹Ð»Ð¸ ÐºÐ°ÐºÐ¸Ð¼-Ñ‚Ð¾ Ð¿Ñ€ÐµÐ¿ÑÑ‚ÑÑ‚Ð²Ð¸ÐµÐ¼. Ð ÐµÑÐ»Ð¸ Ð¿ÐµÑ Ñ…Ð¾Ñ€Ð¾ÑˆÐ¾ Ð²ÐµÐ» ÑÐµÐ±Ñ Ð² Ñ‚Ñ€Ð°Ð¼Ð²Ð°Ðµ â€“ ÐºÐ°Ðº ÑÑ‚Ð¾Ñ‚ Ð¿ÐµÑ â€“ Ñ Ð½Ðµ Ð²Ð¸Ð´ÐµÐ», Ñ‡Ñ‚Ð¾Ð±Ñ‹ ÐºÐ¾Ð½Ð´ÑƒÐºÑ‚Ð¾Ñ€ Ð¿Ð¸Ð½Ð°Ð» ÐµÐ³Ð¾. Ð ÑƒÑÑÐºÐ¸Ðµ Ð½Ðµ Ð¾Ð±Ñ€Ð°Ñ‰Ð°ÑŽÑ‚ Ð²Ð½Ð¸Ð¼Ð°Ð½Ð¸Ñ Ð½Ð° Ð±ÐµÐ·Ð´Ð¾Ð¼Ð½Ñ‹Ñ… Ð¶Ð¸Ð²Ð¾Ñ‚Ð½Ñ‹Ñ…. ÐžÐ½Ð¸ Ð·Ð½Ð°ÑŽÑ‚, Ñ‡Ñ‚Ð¾ Ð¶Ð¸Ð·Ð½ÑŒ Ñ‚ÑÐ¶ÐµÐ»Ð°, Ð° Ð·Ð¸Ð¼Ð° Ð´Ð¾ÑÑ‚Ð°Ñ‚Ð¾Ñ‡Ð½Ð¾ Ð²Ñ€Ð°Ð¶Ð´ÐµÐ±Ð½Ð°. ÐÐµÑÐºÐ¾Ð»ÑŒÐºÐ¾ Ð½ÐµÐ´ÐµÐ»ÑŒ Ð½Ð°Ð·Ð°Ð´ Ñ Ð²Ð¸Ð´ÐµÐ» Ð¿Ð¾ÑÐ»ÐµÐ´ÑÑ‚Ð²Ð¸Ñ Ð½ÐµÑÑ‡Ð°ÑÑ‚Ð½Ñ‹Ñ… ÑÐ»ÑƒÑ‡Ð°ÐµÐ², ÐºÐ¾Ð³Ð´Ð° Ð¿Ð¾ÑÐ²Ð¸Ð»Ð¸ÑÑŒ Ð¿Ð¾Ð³Ð¸Ð±ÑˆÐ¸Ðµ Ð¶Ð¸Ð²Ð¾Ñ‚Ð½Ñ‹Ðµ. Ð’Ð¼ÐµÑÑ‚Ðµ Ñ Ð²ÐµÑÐµÐ½Ð½ÐµÐ¹ Ð¾Ñ‚Ñ‚ÐµÐ¿ÐµÐ»ÑŒÑŽ Ñ€Ð°ÑÑ‚Ð°ÑÐ» ÑÐ½ÐµÐ³ Ñƒ ÑÑ‚Ð²Ð¾Ð»Ð¾Ð² Ð´ÐµÑ€ÐµÐ²ÑŒÐµÐ² Ð¸ Ñƒ ÑÑ‚ÐµÐ½, Ð¸ Ñ‚Ð°Ð¼ Ð¸ ÑÑÐ¼ Ð¿Ð¾ÑÐ²Ð¸Ð»Ð¸ÑÑŒ Ð½Ð°Ð¼Ð¾ÐºÑˆÐ¸Ðµ ÑˆÐµÑ€ÑÑ‚ÑŒ Ð¸ Ð¿Ð»Ð¾Ñ‚ÑŒ â€“ Ñ‡ÐµÑ€Ð½Ñ‹Ðµ Ð¾ÑÑ‚Ð°Ð½ÐºÐ¸ Ð¿Ñ‚Ð¸Ñ†, ÐºÐ¾ÑˆÐµÐº Ð¸ ÑÐ¾Ð±Ð°Ðº. Ð¯ Ð½Ð°Ð´ÐµÑÐ»ÑÑ, Ñ‡Ñ‚Ð¾ Ð±ÐµÐ»Ñ‹Ð¹ Ð¿ÐµÑ Ð²Ñ‹Ð¶Ð¸Ð». ÐŸÐ¾ÑÐ»Ðµ Ñ‚Ð¾Ð³Ð¾ Ð´Ð½Ñ, Ð³ÑƒÐ»ÑÑ Ð¿Ð¾ Ð³Ð¾Ñ€Ð¾Ð´Ñƒ, Ñ Ð½Ð°Ñ‡Ð°Ð» Ð²Ñ‹ÑÐ¼Ð°Ñ‚Ñ€Ð¸Ð²Ð°Ñ‚ÑŒ Ð±ÐµÐ»Ð¾Ð³Ð¾ Ð¿ÑÐ°. Ð˜ Ñ‚Ð¾Ð»ÑŒÐºÐ¾ Ð² ÑÐµÐ½Ñ‚ÑÐ±Ñ€Ðµ Ñ ÑÐ½Ð¾Ð²Ð° ÑƒÐ²Ð¸Ð´ÐµÐ» ÐµÐ³Ð¾. Ð¯ Ð¾Ð±Ð½Ð°Ñ€ÑƒÐ¶Ð¸Ð» ÐµÐ³Ð¾ Ð½Ð° Ñ‚Ñ€Ð°Ð¼Ð²Ð°Ðµ Ð½Ð¾Ð¼ÐµÑ€ 18 â€“ Ñ‚Ð°Ð¼ Ð¶Ðµ, Ð³Ð´Ðµ Ð¸ Ñ€Ð°Ð½ÑŒÑˆÐµ. ÐÐ°ÑÑ‚ÑƒÐ¿Ð°Ð» Ñ‡Ð°Ñ Ð¿Ð¸Ðº, Ð¸ Ñ‚Ñ€Ð°Ð¼Ð²Ð°Ð¹ Ð±Ñ‹Ð» Ð¿ÐµÑ€ÐµÐ¿Ð¾Ð»Ð½ÐµÐ½. Ð›ÑŽÐ´Ð¸ Ð²Ð¾Ð·Ð²Ñ‹ÑˆÐ°Ð»Ð¸ÑÑŒ Ð½Ð°Ð´ Ð½Ð¸Ð¼, Ð¸ Ð¾Ð½ Ð¿Ð¾Ð´Ð½Ð¸Ð¼Ð°Ð» Ð³Ð»Ð°Ð·Ð°, Ð¾ÑÑ‚ÐµÑ€ÐµÐ³Ð°ÑÑÑŒ, ÐºÐ°Ðº Ð±Ñ‹ ÐºÑ‚Ð¾-Ð½Ð¸Ð±ÑƒÐ´ÑŒ Ð½Ðµ Ð½Ð°ÑÑ‚ÑƒÐ¿Ð¸Ð» ÐµÐ¼Ñƒ Ð½Ð° Ð»Ð°Ð¿Ñƒ. Ð§ÐµÐ³Ð¾ Ð¶Ðµ Ñ…Ð¾Ñ‚ÐµÐ» ÑÑ‚Ð¾Ñ‚ Ð¿ÐµÑ? Ð’Ð¾Ð·Ð¼Ð¾Ð¶Ð½Ð¾, Ð¿Ð¾ÐµÑÑ‚ÑŒ. ÐÐ¾, ÐµÑÐ»Ð¸ Ð¸ Ñ‚Ð°Ðº, Ñ‚Ð¾ Ð¾Ð½ Ð¾Ñ‡ÐµÐ½ÑŒ Ð½ÐµÐ½Ð°Ð²ÑÐ·Ñ‡Ð¸Ð²Ð¾ Ð´Ð°Ð²Ð°Ð» ÑÑ‚Ð¾ Ð¿Ð¾Ð½ÑÑ‚ÑŒ. Ð’ Ð½ÐµÐ¼ Ð½Ðµ Ð±Ñ‹Ð»Ð¾ Ð½Ð¸ ÐºÐ°Ð¿Ð»Ð¸ Ð½Ð°Ð²ÑÐ·Ñ‡Ð¸Ð²Ð¾ÑÑ‚Ð¸. Ð­Ñ‚Ð¾ Ð±Ñ‹Ð» Ð³Ð¾Ñ€Ð´Ñ‹Ð¹ Ð¿ÐµÑ. Ð¥Ð¾Ð·ÑÐ¹ÐºÐ° Ð±ÐµÐ»Ð¾Ð³Ð¾ Ð¿ÑÐ° Ð¿Ð¾Ð²ÐµÑ€Ð½ÑƒÐ»Ð° Ð¾Ñ‚ Ñ€Ñ‹Ð½Ð¾Ñ‡Ð½Ð¾Ð¹ ÑˆÑƒÐ¼Ð¸Ñ…Ð¸ Ð½Ð° ÐšÐ»Ð¸Ð½Ð¸Ñ‡ÐµÑÐºÑƒÑŽ, Ð¼Ð¸Ð¼Ð¾ Ñ†Ð²ÐµÑ‚Ð¾Ñ‡Ð½Ñ‹Ñ… Ñ€ÑÐ´Ð¾Ð² Ñ Ð¿Ñ€Ð¾Ð´Ð°Ð²Ñ†Ð°Ð¼Ð¸, ÑÐ¸Ð´ÐµÐ²ÑˆÐ¸Ð¼Ð¸ Ð½Ð° Ñ‚Ð°Ð±ÑƒÑ€ÐµÑ‚ÐºÐ°Ñ… Ð²Ð¾Ð·Ð»Ðµ Ð²ÐµÐ´ÐµÑ€Ð¾Ðº Ñ Ð³Ð²Ð¾Ð·Ð´Ð¸ÐºÐ°Ð¼Ð¸ Ð¸ Ñ€Ð¾Ð·Ð°Ð¼Ð¸. Ð—Ð´ÐµÑÑŒ Ð¿ÐµÑ Ð¿Ñ€Ð¸Ð¾ÑÑ‚Ð°Ð½Ð¾Ð²Ð¸Ð»ÑÑ. ÐžÐ½ Ð¿Ð¾ÑÐ¼Ð¾Ñ‚Ñ€ÐµÐ» Ð½Ð° Ñ†Ð²ÐµÑ‚Ñ‹, Ð¿Ð¾Ð²ÐµÑ€Ð½ÑƒÐ» Ð³Ð¾Ð»Ð¾Ð²Ñƒ Ðº Ð´Ð°Ð¼Ðµ Ð² ÑˆÐ°Ñ€Ñ„Ðµ, Ð¿Ñ€Ð¾Ð´Ð¾Ð»Ð¶Ð°Ð²ÑˆÐµÐ¹ ÑÐ²Ð¾Ð¹ Ð¿ÑƒÑ‚ÑŒ Ð¿Ð¾ Ñ‚Ñ€Ð¾Ñ‚ÑƒÐ°Ñ€Ñƒ. Ð—Ð°Ñ‚ÐµÐ¼, ÐºÐ°Ðº Ð¼Ð½Ðµ Ð¿Ð¾ÐºÐ°Ð·Ð°Ð»Ð¾ÑÑŒ, Ñ Ñ‡ÐµÐ¼-Ñ‚Ð¾ Ð²Ñ€Ð¾Ð´Ðµ Ð¿ÐµÑ‡Ð°Ð»ÑŒÐ½Ð¾Ð¹ Ñ€ÐµÑˆÐ¸Ð¼Ð¾ÑÑ‚Ð¸ Ð¾Ð½ Ð¿Ð¾ÑˆÐµÐ» Ð·Ð° Ð½ÐµÐ¹. Ð¡Ñ‚Ñ€Ð°Ð½Ð½Ñ‹Ð¼ Ð±Ñ‹Ð»Ð¾ ÑÑ‚Ð¾ ÑÐ¾Ð±Ð°Ñ‡ÑŒÐµ Ð¿Ñ€ÐµÐ´ÑÑ‚Ð°Ð²Ð»ÐµÐ½Ð¸Ðµ. Ð¯ Ð¿Ñ€Ð¸Ð´ÑƒÐ¼Ð°Ð» Ð¾ Ð½ÐµÐ¼ ÑÐ»Ð¸ÑˆÐºÐ¾Ð¼ Ð¼Ð½Ð¾Ð³Ð¾. ÐŸÐµÑ Ð½Ðµ Ð¼Ð¾Ð³ Ð¼ÐµÑ‡Ñ‚Ð°Ñ‚ÑŒ Ð¾ Ñ‚Ð¾Ð¼, Ñ‡Ñ‚Ð¾Ð±Ñ‹ Ð´Ð°Ñ€Ð¸Ñ‚ÑŒ Ñ†Ð²ÐµÑ‚Ñ‹. ÐšÐ°Ðº Ð±Ñ‹ Ñ‚Ð°Ð¼ Ð½Ð¸ Ð±Ñ‹Ð»Ð¾, Ð¾Ð´Ð½Ð¾ Ð±Ñ‹Ð»Ð¾ ÑÑÐ½Ð¾. ÐžÐ½ Ð¸ÑÐºÐ°Ð» Ð¶ÐµÐ½Ñ‰Ð¸Ð½Ñƒ. ÐžÐ½ Ð±Ñ‹Ð» ÑƒÑ…Ð°Ð¶ÐµÑ€Ð¾Ð¼. Ð’ Ð¿Ð¾ÑÐ»ÐµÐ´Ð½Ð¸Ð¹ Ñ€Ð°Ð· Ñ ÑƒÐ²Ð¸Ð´ÐµÐ» Ð±ÐµÐ»Ð¾Ð³Ð¾ Ð¿ÑÐ° Ð¸Ð· Ñ‚Ñ€Ð°Ð¼Ð²Ð°Ñ Ð´Ð¾Ð¶Ð´Ð»Ð¸Ð²Ñ‹Ð¼ Ð´Ð½ÐµÐ¼ Ð² Ð¿Ñ€ÐµÐ´Ð´Ð²ÐµÑ€Ð¸Ð¸ Ð·Ð¸Ð¼Ñ‹. ÐžÐ½ ÑˆÐµÐ» Ð¿Ð¾ ÐŸÐ¾Ð»Ð¾Ð²Ð¾Ð¹ ÑƒÐ»Ð¸Ñ†Ðµ Ð² Ð½Ð°Ð¿Ñ€Ð°Ð²Ð»ÐµÐ½Ð¸Ð¸ Ñ€ÐµÐºÐ¸. Ð¢Ð¾Ð»Ð¿Ð° Ð² Ñ‚Ñ€Ð°Ð¼Ð²Ð°Ðµ Ð·Ð°ÐºÑ€Ñ‹Ð»Ð° Ð¾Ñ‚ Ð¼ÐµÐ½Ñ Ð¾ÐºÐ½Ð°. Ð¯ Ð½Ðµ Ñ…Ð¾Ñ‚ÐµÐ» ÐµÐ³Ð¾ Ð¿Ð¾Ñ‚ÐµÑ€ÑÑ‚ÑŒ, Ð¿Ð¾ÑÑ‚Ð¾Ð¼Ñƒ Ð´Ð²Ð¸Ð½ÑƒÐ»ÑÑ Ðº Ð´Ð²ÐµÑ€ÑÐ¼ Ð¸, ÐºÐ¾Ð³Ð´Ð° Ð¾Ð½Ð¸ Ð¾Ñ‚ÐºÑ€Ñ‹Ð»Ð¸ÑÑŒ, Ð±Ñ€Ð¾ÑÐ¸Ð»ÑÑ Ð½Ð° ÑƒÐ»Ð¸Ñ†Ñƒ. Ð›Ð°Ð²Ð¸Ñ€ÑƒÑ Ð¼ÐµÐ¶Ð´Ñƒ Ð¿Ñ€Ð¾Ñ…Ð¾Ð¶Ð¸Ð¼Ð¸, Ñ Ð¾ÐºÐ°Ð·Ð°Ð»ÑÑ Ð±Ð»Ð¸Ð¶Ðµ. Ð‘ÐµÐ»Ñ‹Ð¹ Ð¿ÐµÑ Ð±Ñ‹Ð», ÐºÐ°Ðº Ð¸ Ð¿Ñ€ÐµÐ¶Ð´Ðµ, Ð² ÑˆÐ°Ð³Ðµ-Ð´Ñ€ÑƒÐ³Ð¾Ð¼ Ð¿Ð¾Ð·Ð°Ð´Ð¸ ÐºÐ°ÐºÐ¾Ð¹-Ñ‚Ð¾ Ð¶ÐµÐ½Ñ‰Ð¸Ð½Ñ‹. Ð­Ñ‚Ð° Ð±Ñ‹Ð»Ð° ÑÑ‚Ð°Ñ€ÑˆÐµ, Ñ Ð¿Ð°Ð»Ð¾Ñ‡ÐºÐ¾Ð¹; Ð²Ð¾Ð·Ð¼Ð¾Ð¶Ð½Ð¾, Ð¾Ð½Ð° Ð±Ñ‹Ð»Ð° Ð±Ð°Ð±ÑƒÑˆÐºÐ¾Ð¹. ÐžÐ½Ð° Ð½Ðµ Ð¾Ð³Ð»ÑÐ´Ñ‹Ð²Ð°Ð»Ð°ÑÑŒ. ÐžÐ½Ð° Ð¿Ñ€Ð¾ÑˆÐ»Ð° Ð¿ÐµÑ€ÐµÐºÑ€ÐµÑÑ‚Ð¾Ðº Ñ Ð¿Ñ€Ð¾ÑÐ¿ÐµÐºÑ‚Ð¾Ð¼ Ð›ÐµÐ½Ð¸Ð½Ð°, Ð¼Ð¸Ð¼Ð¾ Ð¿Ð°Ñ€Ð½ÐµÐ¹ Ð² ÐºÐ¾Ð¶Ð°Ð½Ñ‹Ñ… ÐºÑƒÑ€Ñ‚ÐºÐ°Ñ…, Ð¿Ñ€Ð¾Ð´Ð°ÑŽÑ‰Ð¸Ñ… Ñ Ð»Ð¾Ñ‚ÐºÐ¾Ð² Ð²Ð¸Ð´ÐµÐ¾ÐºÐ°ÑÑÐµÑ‚Ñ‹, Ð¼Ð¸Ð¼Ð¾ Ñ‚Ð°Ð´Ð¶Ð¸ÐºÐ¾Ð² Ñ ÑÑƒÑ…Ð¾Ñ„Ñ€ÑƒÐºÑ‚Ð°Ð¼Ð¸, Ð¼Ð¸Ð¼Ð¾ Ð±ÐµÐ·Ð½Ð¾Ð³Ð¾Ð³Ð¾, ÐºÐ¾Ñ‚Ð¾Ñ€Ñ‹Ð¹ Ð²ÑÐµÐ³Ð´Ð° ÑÐ¸Ð´ÐµÐ» Ð·Ð´ÐµÑÑŒ Ð½Ð° ÐºÐ¾Ð²Ñ€Ð¸ÐºÐµ. ÐŸÐ¾ÑÐ»Ñ‹ÑˆÐ°Ð»Ð¾ÑÑŒ Ð»ÑÐ·Ð³Ð°Ð½ÑŒÐµ Ð¸ Ð³Ñ€Ð¾Ñ…Ð¾Ñ‚ Ñ‚Ñ€Ð°Ð¼Ð²Ð°Ñ ÑÐ¿Ñ€Ð°Ð²Ð°, Ñ Ð¿Ñ€Ð¾ÑÐ¿ÐµÐºÑ‚Ð° Ð›ÐµÐ½Ð¸Ð½Ð°. Ð£ÑÐ»Ñ‹ÑˆÐ°Ð², Ð±Ð°Ð±ÑƒÑˆÐºÐ° ÑƒÑÐºÐ¾Ñ€Ð¸Ð»Ð° ÑˆÐ°Ð³, Ð´Ð° Ð¸ Ð±ÐµÐ»Ñ‹Ð¹ Ð¿ÐµÑ Ð½Ðµ Ð¾Ñ‚ÑÑ‚Ð°Ð²Ð°Ð». ÐžÐ½Ð¸ Ð¿Ð¾Ð´Ñ…Ð¾Ð´Ð¸Ð»Ð¸ Ðº ÑƒÐ³Ð»Ñƒ, Ðº Ñ‚Ð¾Ñ€Ð³Ð¾Ð²Ñ†Ð°Ð¼ Ñ†Ð²ÐµÑ‚Ð°Ð¼Ð¸. Ð¯ Ð¿Ð¾Ð´ÑƒÐ¼Ð°Ð», Ñ‡Ñ‚Ð¾ Ð¾Ð½ Ð½Ð¸ Ð² ÐºÐ¾ÐµÐ¼ ÑÐ»ÑƒÑ‡Ð°Ðµ Ð½Ðµ Ð¾ÑÑ‚Ð°Ð½Ð¾Ð²Ð¸Ñ‚ÑÑ. ÐÐ°Ð²ÐµÑ€Ð½Ð¾Ðµ, Ñ ÑÐºÐ°Ð·Ð°Ð» ÑÑ‚Ð¾ Ð²ÑÐ»ÑƒÑ…. Ð‘Ð°Ð±ÑƒÑˆÐºÐ° Ð¿Ñ€Ð¾ÑˆÐ»Ð° Ð¼Ð¸Ð¼Ð¾ Ñ†Ð²ÐµÑ‚Ð¾Ð², Ð²ÑÐµ Ð±Ñ‹ÑÑ‚Ñ€ÐµÐµ Ñ€Ð°Ð±Ð¾Ñ‚Ð°Ñ ÑÐ²Ð¾ÐµÐ¹ Ð¿Ð°Ð»Ð¾Ñ‡ÐºÐ¾Ð¹, Ð¿Ð¾ Ð¼ÐµÑ€Ðµ Ñ‚Ð¾Ð³Ð¾, ÐºÐ°Ðº Ñ‚Ñ€Ð°Ð¼Ð²Ð°Ð¹Ð½Ñ‹Ð¹ Ð¿ÐµÑ€ÐµÐ·Ð²Ð¾Ð½ ÑÑ‚Ð°Ð½Ð¾Ð²Ð¸Ð»ÑÑ Ð³Ñ€Ð¾Ð¼Ñ‡Ðµ. ÐÐ¾ Ð±ÐµÐ»Ñ‹Ð¹ Ð¿ÐµÑ Ð¾ÑÑ‚Ð°Ð½Ð¾Ð²Ð¸Ð»ÑÑ. ÐžÐ½ Ð½Ðµ Ð¾Ð±Ð½ÑŽÑ…Ð¸Ð²Ð°Ð» Ñ‚Ñ€ÐµÑ‰Ð¸Ð½ÐºÐ¸ Ð½Ð° Ñ‚Ñ€Ð¾Ñ‚ÑƒÐ°Ñ€Ðµ, Ð° Ð¿Ñ€Ð¾ÑÑ‚Ð¾ Ð¾ÑÑ‚Ð°Ð½Ð¾Ð²Ð¸Ð»ÑÑ Ð¸ ÑƒÑÑ‚Ñ€ÐµÐ¼Ð¸Ð» Ð²Ð·Ð³Ð»ÑÐ´ Ð½Ð° Ð²ÐµÐ´Ñ€Ð° Ñ Ñ†Ð²ÐµÑ‚Ð°Ð¼Ð¸, ÑÑ‚Ð¾ÑÐ²ÑˆÐ¸Ðµ Ð² Ñ‚Ñ€Ð¸ Ñ€ÑÐ´Ð°. ÐšÑ€Ð°ÑÐ½Ð¾-Ð±ÐµÐ»Ñ‹Ð¹ Ñ‚Ñ€Ð°Ð¼Ð²Ð°Ð¹ Ñ Ð¿Ñ€Ð¾Ð½Ð·Ð¸Ñ‚ÐµÐ»ÑŒÐ½Ñ‹Ð¼ Ð²Ð¸Ð·Ð³Ð¾Ð¼ Ð¾ÑÑ‚Ð°Ð½Ð¾Ð²Ð¸Ð»ÑÑ Ð¿Ð¾ÑÑ€ÐµÐ´Ð¸ Ð¿Ñ€Ð¾ÑÐ¿ÐµÐºÑ‚Ð° Ð›ÐµÐ½Ð¸Ð½Ð°. Ð‘ÐµÐ»Ñ‹Ð¹ Ð¿ÐµÑ Ð¿ÐµÑ€ÐµÐ²ÐµÐ» Ð²Ð·Ð³Ð»ÑÐ´ Ñ Ñ†Ð²ÐµÑ‚Ð¾Ð² Ð½Ð° Ð±Ð°Ð±ÑƒÑˆÐºÑƒ. ÐžÐ½Ð° ÑˆÐ»Ð° Ð²Ð¿ÐµÑ€ÐµÐ´ Ðº Ñ‚Ð¾Ð»Ð¿Ðµ. Ð‘Ñ€Ð¾ÑÐ¸Ð² Ð¿Ñ€Ð¾Ñ‰Ð°Ð»ÑŒÐ½Ñ‹Ð¹ Ð²Ð·Ð³Ð»ÑÐ´ Ð½Ð° Ð²ÑÐµ Ð¾Ð±Ð¸Ð»Ð¸Ðµ Ñ†Ð²ÐµÑ‚Ð¾Ð², Ð¾Ð½ Ð¾Ð¿ÑƒÑÑ‚Ð¸Ð» Ð³Ð¾Ð»Ð¾Ð²Ñƒ Ð¸ Ñ‚Ð¾Ñ€Ð¾Ð¿Ð»Ð¸Ð²Ð¾ Ð¿ÐµÑ€ÐµÑÐµÐº ÑƒÐ»Ð¸Ñ†Ñƒ. Ð”Ð²ÐµÑ€Ð¸ Ñ‚Ñ€Ð°Ð¼Ð²Ð°Ñ Ð¾Ñ‚ÐºÑ€Ñ‹Ð»Ð¸ÑÑŒ. Ð‘ÐµÐ»Ñ‹Ð¹ Ð¿ÐµÑ Ð¿Ð¾Ð½ÑŽÑ…Ð°Ð» Ð±Ð°Ð±ÑƒÑˆÐºÐ¸Ð½ ÑÐ»ÐµÐ´, Ð¸ Ð¾Ð½Ð¸ Ð·Ð°Ð±Ñ€Ð°Ð»Ð¸ÑÑŒ Ð²Ð½ÑƒÑ‚Ñ€ÑŒ. ÐŸÐ¾-Ð¼Ð¾ÐµÐ¼Ñƒ, Ð¾Ð½Ð° ÐµÐ³Ð¾ Ñ‚Ð°Ðº Ð¸ Ð½Ðµ Ð·Ð°Ð¼ÐµÑ‚Ð¸Ð»Ð°. Ð’ÐµÑÑŒ ÑÐ»ÐµÐ´ÑƒÑŽÑ‰Ð¸Ð¹ Ð³Ð¾Ð´ Ñ Ð²Ñ‹ÑÐ¼Ð°Ñ‚Ñ€Ð¸Ð²Ð°Ð» Ð±ÐµÐ»Ð¾Ð³Ð¾ Ð¿ÑÐ°, Ð½Ð¾ Ð½Ð°Ð¿Ñ€Ð°ÑÐ½Ð¾. ÐœÐ¾Ð¶ÐµÑ‚ Ð±Ñ‹Ñ‚ÑŒ, Ð¾Ð½ Ð½Ðµ ÑÑƒÐ¼ÐµÐ» Ð¿ÐµÑ€ÐµÐ¶Ð¸Ñ‚ÑŒ Ð·Ð¸Ð¼Ñƒ. Ð¥Ð¾Ñ‚Ñ, Ð¾Ð¿ÑÑ‚ÑŒ Ð¶Ðµ, ÐµÐ³Ð¾ Ð Ð¾ÑÑÐ¸Ñ – ÑÑ‚Ð¾ ÑÑ‚Ñ€Ð°Ð½Ð° Ð¶ÐµÐ½Ñ‰Ð¸Ð½, Ð° ÐµÐ¼Ñƒ Ð¸ Ð½ÑƒÐ¶Ð½Ð°-Ñ‚Ð¾ Ð±Ñ‹Ð»Ð° Ð²ÑÐµÐ³Ð¾ Ð¾Ð´Ð½Ð°. ÐœÐ¾Ð¶ÐµÑ‚ Ð±Ñ‹Ñ‚ÑŒ, Ð¾Ð½ ÐµÐµ Ð½Ð°ÑˆÐµÐ».